The ISO 12647-7 proofing standard was revised in November 2016 and the test criteria for FograCert contract proof creation were adapted. We have now incorporated these changed criteria into our proofing system and are now working to the stricter tolerances of the latest ISO 12647-7:2016. The good news is: you won’t notice that our proofs are now precisely produced according to the latest standards. Why? Quite simply: Because our demands on our proofing system, our FIERY proofing software, our EFI proofing papers and the X-Rite measuring decvices are already so high that all components of our proofing system – and of course our proofs themselves – have been meeting the new criteria of the revised November 2016 standard for years. The new standard brings the classical formula for the colour distance Delta-E from the traditional definition of 1976 (CIELAB 1976) to the updated version of 2000 (CIEDE2000). Since the values cannot be converted directly, new tolerances for the test report are introduced, which are valid immediately. These new tolerances and new criteria are also the only difference that you will notice on our proof when you take a closer look at it. Why this change: Fogra used measurements from the 116 Contract Proof Certifications from 2016 to show that the old and new tolerances of the old? These colors have so far had a? E-value that is too high in relation to the visual assessment. The new Delta-E values, on the other hand, are much more “equidistant”, i. e. with the human assessment of the colour distance, which Fogra has also demonstrated in tests. The deviations of the gray axis and hue are now also determined more precisely, the evaluation of the hue spacing? You can also see this on the test report. The Fogra writes:”Since HC mainly depends on the hue angle, the evaluation of neutral grey or similar colours with sometimes very large differences in brightness and saturation did not yield meaningful results. The measure?Ch now describes the actual distance of a color pair in the CIEa*b* plane and is therefore no longer suitable only for the evaluation of the colorfulness difference of very rich colors. A proof now has to pass through all of the above tests without any difficulty, whereby it is now regulated that a new proof is used for each test, i. e. not a copy has to pass all tests one after the other. Three years ago, the offset standard already included the categorisation of the optical brightener content in the offset standard, the proofing standard is now following suit and uses the same classification. The brightener content of the proof paper should be similar to that of the used support paper or belong to the same category, similar to the gloss of the proof paper. 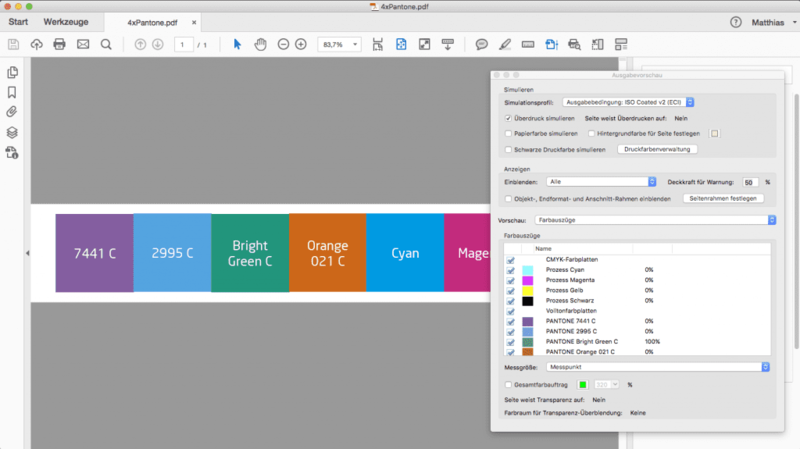 The new revision of the standard also includes criteria for the evaluation of spot colours such as PANTONE, HKS or TOYO. These can now optionally be evaluated within the standard, which is then done via a separate media wedge with test report. For measured spot colours, the tolerance for colour deviation must be within Delta-E 2.5. In the example shown here, a proof file consisting of colored squares with 4 additional PANTONE spot colors is output: PANTONE 7441 C, PANTONE 2995 C, PANTONE Bright Green C and PANTONE ORANGE 021 C. These spot colors are recognized by the RIP and assigned to the respective internal color values, which can be seen in the line in the job ticket. Between Jobticket and UGRA/Fogra media wedge, an additional media wedge can now be printed on which the contained spot colors – in this case the four PANTONE colors – are mapped. The measured results of the special color deviations can then be output in a separate test report. A proof is prepared according to the currently valid ISO standard 12647-7 and is legally binding with a UGRA-Fogra media wedge and measurement report. How does this check work? 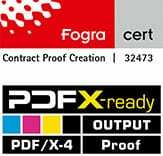 If you need a proof with UGRA/Fogra Media Wedge CMYK V3.0, there are two ways to add the test report to your data. With proofing devices in which a measuring device is integrated, the media wedge with 3×24 standardised colour fields is printed directly under the proof data. This media wedge is driven directly in the proofing device to a kind of “hair dryer” in the measuring device and dried there. After a few minutes of drying, the media wedge continues and is measured directly in the proofer. This takes a few minutes. The measured values determined in this way are returned to the proof server and evaluated there. 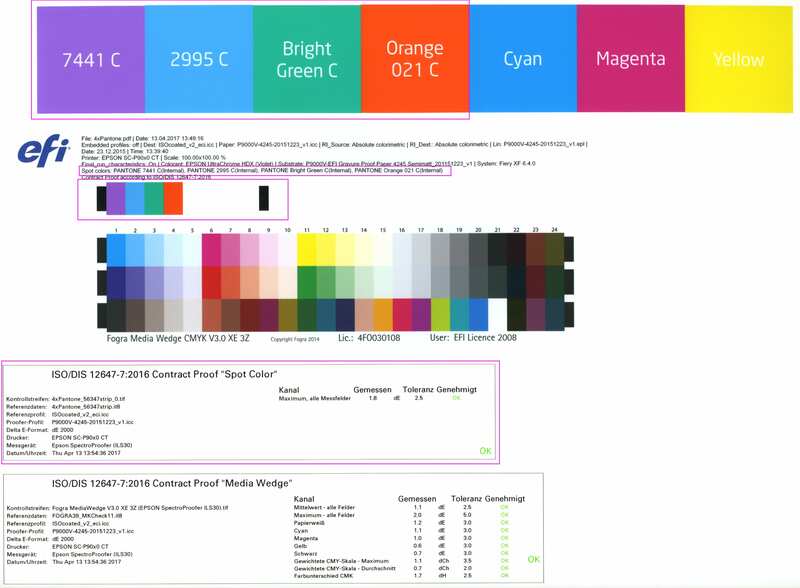 If the color values are correct and within the tolerances of the strict ISO standard, a test report of the measurement is then printed directly under the media wedge, which guarantees you color accuracy in accordance with the process standard offset printing. For proofing devices without integrated measuring device, only the standardized media wedge is printed under the proof data. A check takes place subsequently and outside the proof printer. The media wedge is then measured with an external measuring device and the target and tolerance values are output to a label printer. This label is then stuck directly under the media wedge. What is the advantage of automated creation and checking of the media wedge directly in the proofing device? Measurement is automated directly after proof printing, measurement errors due to manual operating errors are excluded. Since the test report is not subsequently attached, as is often still the case, manipulation is impossible. Further information on the test report, the media wedge and on the work and responsibility of UGRA/Fogra can be found at www.ugra.ch and www.fogra.org.